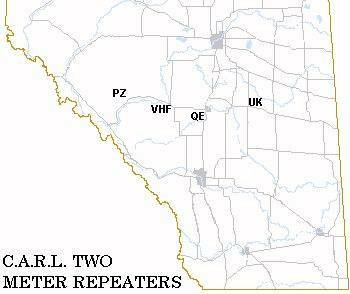 The above repeaters are linked to VE6QE, the central hub.These repeater sites are displayed on the map below. 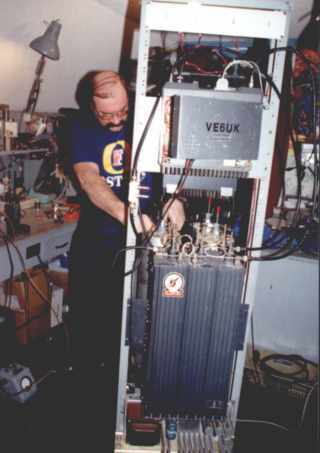 VE6QE frequency is 147.150 with a +600 offset. 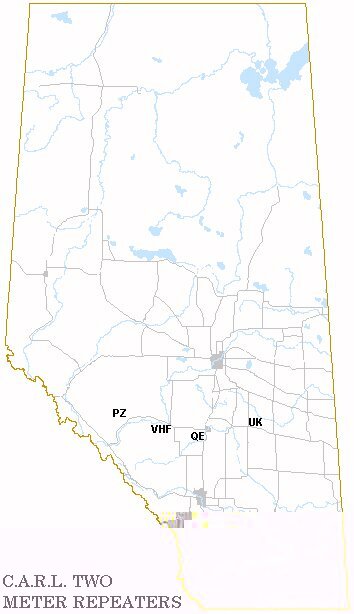 Link frequency out to network 449.750 Link frequency in to VE6QE 444.750 Located in Red Deer .VE6QE has a voice activated controller. 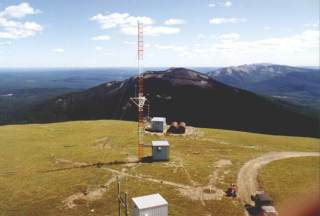 This repeater is the hub to which the other three repeaters are linked providing coverage from the Rocky Mountains to Stettler. The VE6VHF site is now operating off a TEG power supply and a battery backup that is shared with other commercial radios on the same site. The VE6PZ frequency is 145.210 with a -600 offset. Located at Shunda Lookout on Baldy Mountain near Nordegg. 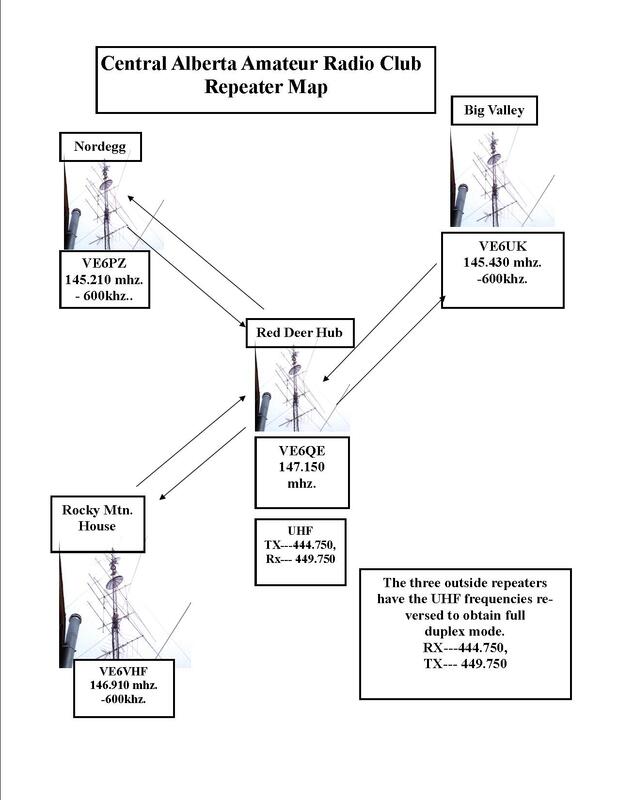 Linked to VE6QE Link frequency in from VE6QE 449.750 Link frequency out to VE6QE 444.750 Note that auto dial brings up the VE6QE repeater and dials local Red Deer area numbers. *911 or *9 will connect to the 911 dispatcher at the Red Deer Fire Department. 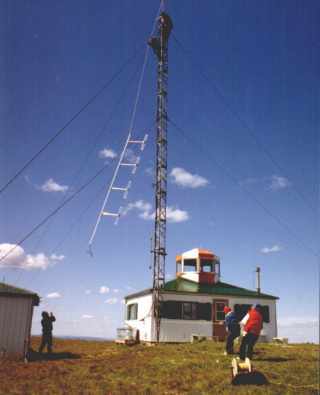 The VE6PZ repeater antennas were installed in 1994. The view from the top of the VE6PZ tower near Nordegg. It’s easy to see why this repeater has such great coverage throughout the foothills of the West Country. As most of you know by now we have installed the new VE6QE (147.150) controller with the previous radio system that was at the site before the lightning strike last summer. As of this date it has been working well with just a few bugs to work out. It is configured to monitor the AC line and give a verbal alarm approximately every 20 minutes until it is restored or the alarm is disabled. There is also an analog lin e monitoring the 12VDC battery input and it will also sound an alarm if the battery voltage drops too low, indicating a battery charger failure. This alarm is also a vocal one that says battery alarm failure after every time the COR circuit drops on the repeater. This may sound excessive and annoying but it is a situation that needs immediate attention due to the large battery string we have going dead and it takes a lot of current to get it charged back up again. The packet system at the site will also be hooked to this alarm system eventually. At this point the digital voice recorder that is hooked to the controller is only programmed with a net night announcement and a meeting announcement message. The main repeater ident. messages that you hear on the repeater all the time are from a preprogrammed robotic sounding voice ID system, and can be substituted with a voice message from the DVR (digital voice recorder). I left it as it is for now mainly because I didn’t think everybody wanted to hear me on there all the time. Another repeater situation has come up dealing with the VE6QE site itself. Up until this point we have been lucky enough to use this tower and location with an agreement we had with CKGY. We originally put the large and well built radio shack there to replace the garden shed they were using back then, with them letting us go on the tower and use their power hookup. We knew back then that some day they were not going to need their radio setup there and that we would have to work with them on possibly taking over the whole site and dealing with the land owner with the lease on the location. Well this has happened and at this time of writing we are going to meet with the people at CKGY and come to some kind of agreement. Probably by the time you all have read this it will have taken place and we will know more about the future of the VE6QE site. I have also started working again on the new repeater to replace the old VE6VHF (146.910) one on Baseline Mountain. The old one is still working well but is getting tired and the new one will be built exactly like the repeaters VE6PZ (145.210) and VE6UK (145.250). 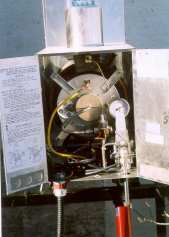 (Editor’s note: See CAARC Repeater Map). This standardization will make it possible to have spare units already built for replacing defective units in the future due to part failures or lightning strikes. I also want to eventually change the VE6QE radios to the same radio components for this reason. 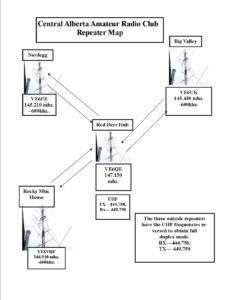 The new repeater should also improve the performance at VE6VHF. This is a list of operation commands that you can use on the new VE6QE controller. 163 ——This is the code to test your signal or hear what your audio sounds like getting into the repeater. It turns on the DVR and records your voice and when you drop the PTT on your radio it instantly plays back what you said. To activate it push 163, drop the PTT and then TX back into the repeater to record your test message. When you drop the PTT it will play back. This is also a list of extra speed dial numbers programmed into the auto patch. When you use them it says back a word to indicate what you are dialing. Some of these just say “calling” because there was no word in the controller library to relate to the phone number. 911 emergency ——–* 9 (emergency) The emergency number can also be dialed as is * 911.